1.1 What does multirate mean? Multirate simply means “multiple sampling rates”. 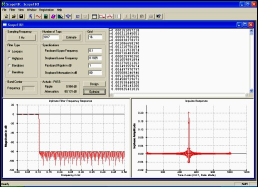 A multirate DSP system uses multiple sampling rates within the system. Whenever a signal at one rate has to be used by a system that expects a different rate, the rate has to be increased or decreased, and some processing is required to do so. Therefore “Multirate DSP” really refers to the art or science of changing sampling rates. 1.2 Why should I do multirate DSP? The most immediate reason is when you need to pass data between two systems which use incompatible sampling rates. For example, professional audio systems use 48 kHz rate, but consumer CD players use 44.1 kHz; when audio professionals transfer their recorded music to CDs, they need to do a rate conversion. But the most common reason is that multirate DSP can greatly increase processing efficiency (even by orders of magnitude! ), which reduces DSP system cost. This makes the subject of multirate DSP vital to all professional DSP practitioners. 1.3 What are the categories of multirate? 1.4 Where can I get software to implement multirate? The distribution file of Iowegian’s ScopeFIR contains a multirate algorithm package that includes decimation, interpolation, and resampling functions written in C. Multirate implementations in other languages are available on GitHub. 1.5 What reference books cover multirate topics?